Crispus Caesar. 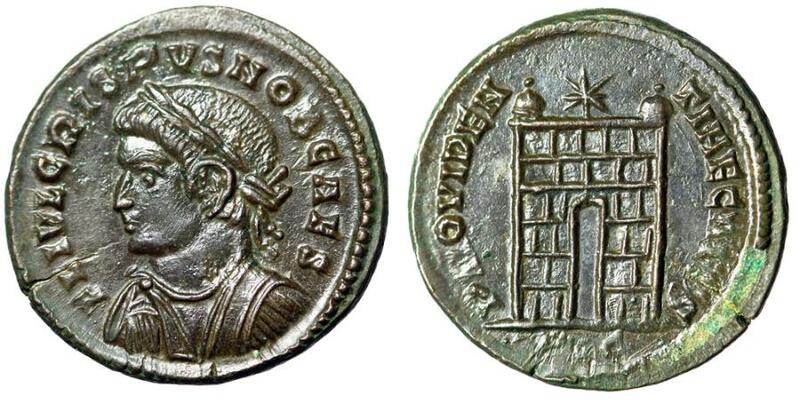 Lugdunum (Lyons) Mint 324-325 AD. Obverse: FL IVL CRISPVS NOB CAES Laurate, draped and cuirassed bust left. Reverse: PROVIDEN - TIAE CAESS Campgate (City Wall) with two turrets, star above and no doors; PLG in exergue. References: RIC 228. Size: 19mm, 3.32g. Professional Numismatic Notes: Choice EF! Some chipping of the beaded border along the lower-right of the reverse; otherwise stunning glossy dark-brown patina!